It is HOT right now. Of course it was much hotter and humid when I was in Louisiana last week. Still, I can’t keep the kids cooped inside our cool, air-conditioned apartment all day. After they get their sillies out at the park, I make myself a Vietnamese ice coffee to get me through the rest of the afternoon. I was never much of a coffee drinker, not even as a college student. Unless someone offered me a creamy, sweet and bitter ice coffee, Vietnamese style. If you’ve never had Vietnamese coffee, be prepared. This will put a kick in your step. It was pretty much the only kind of coffee I would drink until I had kids. Vietnamese coffee originated from its French colonization. Since fresh milk wasn’t common in Vietnam, sweetened condensed milk became the de facto creamer. If Wikipedia can be believed, it was the Vietnamese Americans who started using coffee with chicory, such as Cafe du Monde, for their iced coffee. My mom always used either Cafe du Monde (the gold can) or Community Coffee’s New Orleans Blend. Traditionally, Vietnamese coffee (hot or iced) is made with a special filter, called a phin. I was never patient enough with those, except when I watched it drip, drip, drip next to me while I slurped a hot bowl of restaurant phở. The cold brew method is much easier. With a little bit of preparation, you can cold brew enough coffee to get you through 4 or 5 hot afternoons. I dare you not to drink more than one a day. 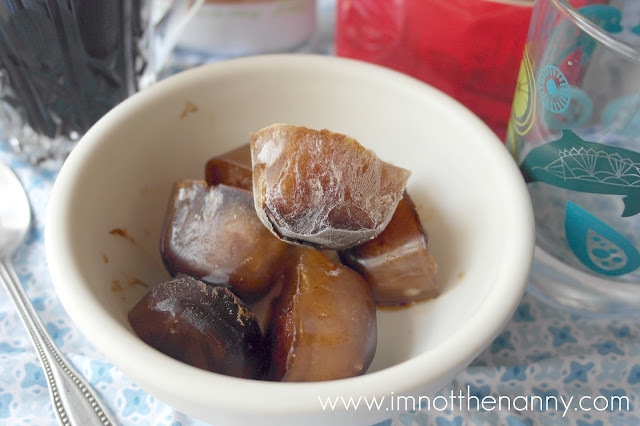 I also made some coffee ice cubes with some leftover coffee just to kick it up a notch. That way when the ice cubes melt, it won’t water down the coffee. If you have a Trader Joe’s near you, grab a squeeze bottle of the sweetened condense milk. It make life a lot easier. Apparently it’s a seasonal item and my TJ’s doesn’t have anymore. Any brand of condensed milk will work. Make cold brewed coffee: I use a ratio of 4 parts water to 1 part coffee grounds. In a clean jar, add enough coffee grounds about 1/4 full. Slowly, add filtered or bottled water. This is going to make a very concentrated coffee so you want better tasting water. Set in the fridge overnight. Now I’ve read that it can take as little as 2 hours but I forget about stuff so overnight works out great. The next morning, strain the coffee using the a coffee filter inserted in a funnel. It should look very thick because it’s super concentrated coffee. The cold brew should last in your fridge for a week. 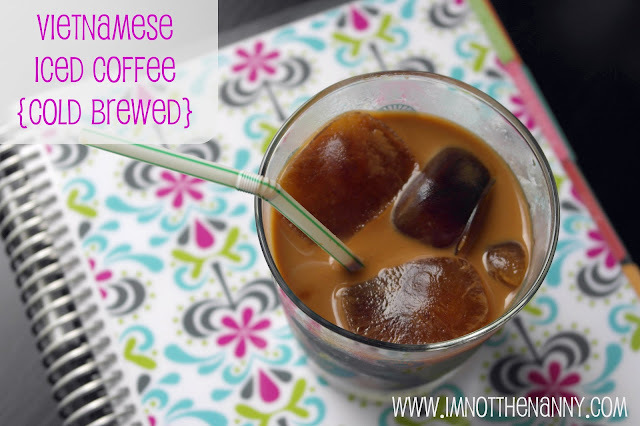 Make the Vietnamese iced coffee: In a highball sized glass, add sweetened condense milk until the bottom is coated. Now add a little bit more. (Isn’t that scientific?) 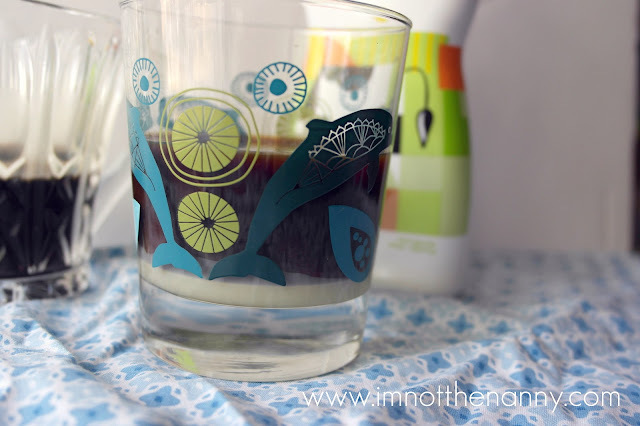 Fill the glass 2/3 full with the cold brewed coffee. Stir until you can no longer see the condensed milk at the bottom of the glass. The coffee will still be fairly dark. Taste and add more condensed milk if needed. Add ice (or coffee ice cubes). Stick a straw in it and pretend you’re at your Vietnamese restaurant. Enjoy the buzz!